The holidays are generally a time to spend money, and much of that money is focused on kids. We always set a fairly low budget for Christmas gifts for our kids, and along with that, we work to do some other fun and cheap Christmas activities for kids – activities that enhance the joy of the holiday season without breaking our budget. Working to find some great and inexpensive activities that we can do with our kids helps to make the Christmas season extra special, and it creates an abundance fun and wonderful memories to look back on. Today I’ll share some of the things we do with our kids during the Christmas/Holiday season that are both fun – and cheap. One of our kids’ favorite family Christmas traditions is our annual baking day -or days. We do one day of holiday baking with grandma every year, baking up sugar cookie cutouts, our homemade fudge, and many other popular Christmas cookies. Then we usually try to add in one more baking day with friends. The baking day with friends is extra casual: we give the kids the ingredients, and with the older kids leading, let them have reign over the kitchen as they use their creativity to make tasty cookie creations. There’s something about cooking and baking together that really bonds people, and since baking from scratch is fairly inexpensive, an annual baking day won’t break your budget either. In the colder weather states, it’s tempting to stay inside during the holiday season, but there are several fun and cheap Christmas activities for kids that can be done at home or outdoors, helping your child to get in some exercise and many times soak up some Vitamin D in the process. Find a great sledding hill and make a day out of sledding, followed by hot cocoa at home. Do some ice skating at a local outdoor public skating rink, which are often times free. Head out to the backyard and make snow angels or snowmen with the kids. or build a couple of snow fort walls and have a good old fashioned snowball fight. Looking for more fun and cheap activities to do with the kids during the holiday season? Put an extra gallon of gas in the tank and head out one evening to look at the Christmas lights on display in your neighborhood or nearby neighborhoods. Pick up some inexpensive craft items, such as construction paper, glitter, cotton balls and pipe cleaners, and see what kinds of Christmas creations the kids can come up with. Or better yet, find a food shelf, mission or other charitable organization that will welcome the help of you and your kids as you serve those less fortunate by helping to supply them with meals, toys or boxes of groceries. Often times, people think that Christmas activities for the kids have to be extravagant and expensive, but there are many things you can do with your kids that will make a positive impact, provide great memories, and still cost very little in the process. What are your favorite inexpensive Christmas activities? 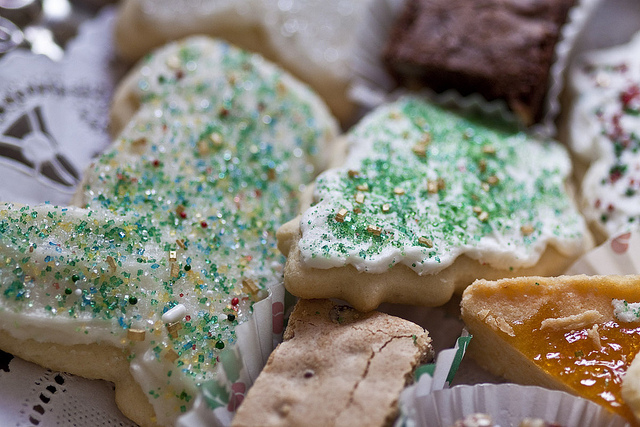 What holiday traditions do you love best? Baking sessions with kids is really fun and can give bonding-quality time. I do it every now and then and get the recipe they like. The fun that we get is really priceless and the learning experience is really helpful in building good parent-children relationship. We would always love to help decorate the tree and house for the holidays. That was usually good to keep us busy for a Saturday. Also, depending on where you live, you could go to nearby towns to watch the lighting of their Christmas trees. Lastly, in my area, there is a small town that charges $10 to drive through the main strip to look at the houses decorated with lights. These houses are over the top with the lights and you can tune to the local radio station to listen to holiday music as you drive through. Love that idea, Jon! Interesting about the town that charges $10 – I’ve never heard of that before. We always have a Christmas cookie bake off around the holidays and it’s great because it not only eats up a whole day, but it’s an indoor activity for when the weather is poor and it allows for a lot of creativity to come through. Plus the best cookies are left for Santa so that makes it even more special. We bake with the kids and drive around and look at Christmas lights. My kids also love our get-togethers with extended family. Love those family get-togethers: they’re the best, aren’t they? An annual baking day sounds like a lot of fun! I might try that with my nieces. Aldo, you should!! What a great and fun day that would be, and I’m sure your nieces would appreciate it so much. I know my kids love spending time with their uncles. Great ideas Laurie! These are all things my parents did with us when we were kids too. Now, we still do a lot of them today even though my brother and I are both adults. Fun times! That is so cool that you guys do a lot of these things still, Kayla! That is definitely our wish for when our kids grow up.